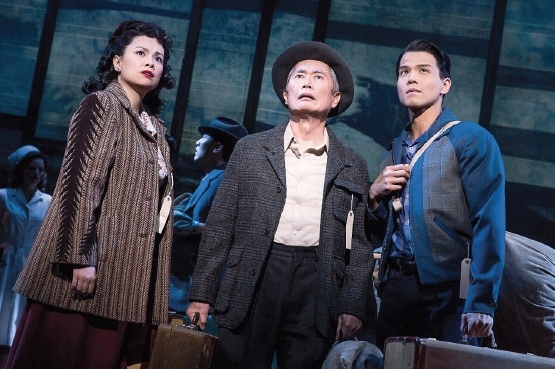 In its annual return to screens around the anniversary of Pearl Harbor Day, Fathom Events is bringing George Takei’s moving Broadway musical “Allegiance,” also starring Tony Award winner Lea Salonga (“Miss Saigon,” “Mulan”) and Telly Leung (“Godspell,” “Glee”), backto cinemas nationwide for an encore event on Dec. 11. Even though it’s been more than two years since “Allegiance” closed on Broadway, through the past special screenings across the globe (as well as the stage run in L.A. earlier this year) the show continues to reach new audiences, and is, in fact, more popular than ever, with a DVD release in the works. “Allegiance to Broadway” will give audiences an in-depth look at the process of taking a show from the page to the stage in a way that no documentary has done before. “Allegiance” tells the story of one family’s extraordinary journey in a troubling time of a nation at war. A mysterious envelope leads Sam Kimura (Takei) back 60 years to a time when he (played as a young man by Leung) and his sister Kei (Salonga) strive to save their family from the wrongful imprisonment of Japanese Americans during World War II. Sam enlists in the Army to prove his family’s loyalty, while Kei joins the draft resisters fighting for the rights of their people. Their paths take them from the lush farmlands of California to the wastelands of Wyoming to the battlefields of Europe, and their divided loyalties threaten to tear them apart forever. But as long-lost memories are relived and a new perspective is gained, Sam finds that it is never too late to forgive and experience the redemptive power of love. “Allegiance to Broadway” follows creators Jay Kuo and Lorenzo Thione, along with the rest of the Broadway musical’s creative team, from page to stage as they grapple with the tough subject matter of this period in American history, and their obligation to maintaining and furthering Takei’s legacy. From rehearsals to marketing meetings and everywhere in between, the documentary sheds a light on the tough nature of show business and the creative decisions that must be faced when trying to navigate the rough waters of Broadway. Presented by Fathom Events and Sing Out, Louise! Productions, “Allegiance to Broadway” will premiere on Tuesday, Dec. 4, at 7:30 p.m. (local time) and “Allegiance’s” encore event will take place on Tuesday, Dec.11, at 7:30 p.m. (local time), in more than 600 select movie theaters, through Fathom’s Digital Broadcast Network. For a complete list of theater locations, visit the Fathom Events website (theaters and participants are subject to change). Tickets for “Allegiance” and “Allegiance to Broadway” can be purchased at www.FathomEvents.com and participating theater box offices. After the showing of both “Allegiance to Broadway” and “Allegiance,” audiences will enjoy new exclusive footage featuring Takei and the Broadway musical’s creative team. With a career spanning six decades, Takei is known around the world for his founding role in the television series “Star Trek,” in which he played Hikaru Sulu, helmsman of the starship Enterprise. But Takei’s story goes where few stories have gone before. From a childhood spent with his family wrongfully imprisoned in a Japanese American internment camp to becoming one of the country’s leading figures in the fight for social justice, LGBTQ rights and marriage equality, Takei remains a powerful voice on issues ranging from politics to pop culture. Takei made his Broadway debut in “Allegiance,” which ran in New York in 2015 and 2016.